How Smart Are Great Danes? You're the proud owner of a dog so wonderful he has "great" in his name, so he must be pretty accomplished, right? The Great Dane has many admirable qualities making him a solid choice for a family companion. Though he's not the smartest breed dog, he's intelligent enough to learn how to be a responsible, happy family member. He's more likely to eat your homework than to help you with it, but he'll learn to sit nicely by your side. If you're wondering how smart your Great Dane is, you'll have to be satisfied with the answer "about average." Canine intelligence tests aren't comparable to human intelligence tests, which rank according to intelligence; instead, they only point out where your dog fares in certain skills. However, there are some basic indicators about breed intelligence to compare your Great Dane to other breeds. Psychologist and dog author Dr. Stanley Coren conducted a study, sending out extensive questionnaires to 199 dog obedience judges registered with the American Kennel Club and the Canadian Kennel Club. Based on his findings, he was able to rank 133 breeds of dogs based on one of three levels of intelligence. The Great Dane ranked number 48 out of 79 on the list, tied with the boxer. Dr. Coren notes dogs have three types of intelligence. The first type, instinctive intelligence, refers to what a dog is bred for. For example, herding dogs were bred to round up animals and keep them close together while driving them in a specific direction. A herding dog's instinct gives him the intelligence to excel at these tasks with human input only necessary for direction and control. Border collies are exalted as the most intelligent of dogs, but if you put one to work in the Great Dane's historic role as a tough hunter, chances are he wouldn't match the Great Dane's success. Of course, dogs learn to do many things they aren't born to do; the measure of what a dog can learn to do for himself is what Dr. Coren refers to as adaptive intelligence. This skill allows a dog to solve problems and benefit from experience. Adaptive intelligence is more measurable, and you'll get an idea of how your Great Dane fares by watching how he responds to the same things. For example, how long does it take him to get used to the Friday evening baby sitter? Does each visit entail a new introduction, or is your dog used to the routine comings and goings in the house? Adaptive intelligence varies by dog, so your Great Dane may be lingering in kindergarten or he may be headed to college in this area of intelligence. Working, or obedience, intelligence is what a dog can learn to do when he's instructed by people. 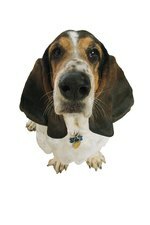 Your Great Dane's 48 score on Dr. Coren's scale puts him in a group of dog breeds with average working/obedience intelligence. According to Dr. Coren's study, the Great Dane -- and other dogs in this group -- tends to require 25 to 40 repetitions to understand a new command, and about half the time he'll obey a command on its first order. That doesn't mean the Great Dane is stupid, nor does it mean he's not as good a choice for a pet as one of the higher rated dogs, such as the poodle or papillon. It also doesn't mean he's a better choice than a beagle or bulldog, who are at the lower end of the scale. It only means you have a dog who tends to be average in learning new tasks and that you'll need to be patient and consistent when teaching him how to be a welcome family member.